This Tiny Emergency Flashlight Runs on… Water? The Blackout Buddy H20 is an emergency flashlight powered not by batteries but by perhaps the unlikeliest of things—water. Hurricane season is here, so we’ve been digging through our emergency kits to double-check our preparedness. Water bottles? Check. Nonperishable foods? Check. First aid? Check. Candles, matches, and flashlights with spare batteries? Well, turns out these no longer need to overstuff your supply box, not so long as you’re equipped with this, the newest emergency light on the market. Believe it or not, it’s a flashlight powered not by batteries or even by sunlight, but by perhaps the unlikeliest of things—water. 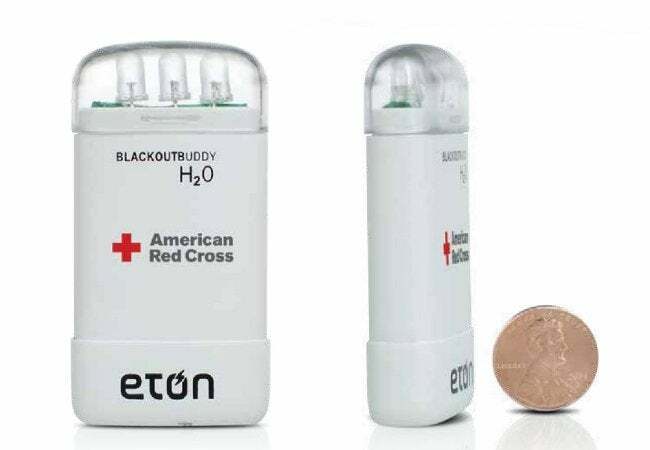 Called the Blackout Buddy H2O and produced by Eton in conjunction with the American Red Cross, the device starts up with a splash of water on its Magnesium-oxide battery. Once charged, the LED light shines continuously for up to 72 hours. When you see the light dimming, simply splash more water onto the unit. There’s no need to worry about getting it more than a little wet, as the flashlight works even when completely submerged. Pick it up this week—which is, wouldn’t you know it, Fire Prevention Week—on Amazon for about $15. There’s no reason not to stock up, because even if you don’t need the flashlight this season, and we hope you don’t, you can keep it stashed in your kit—for a decade! The Blackout Buddy lasts for ten years or more.